Rock Salt & Winter Essentials Be prepared for the winter months which are getting harsher every year. In particular dont delay your ordering of our Rock Salt!!! Be prepared for the winter months which are getting harsher every year. 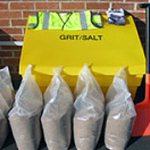 In particular dont delay your ordering of our Rock Salt!! !